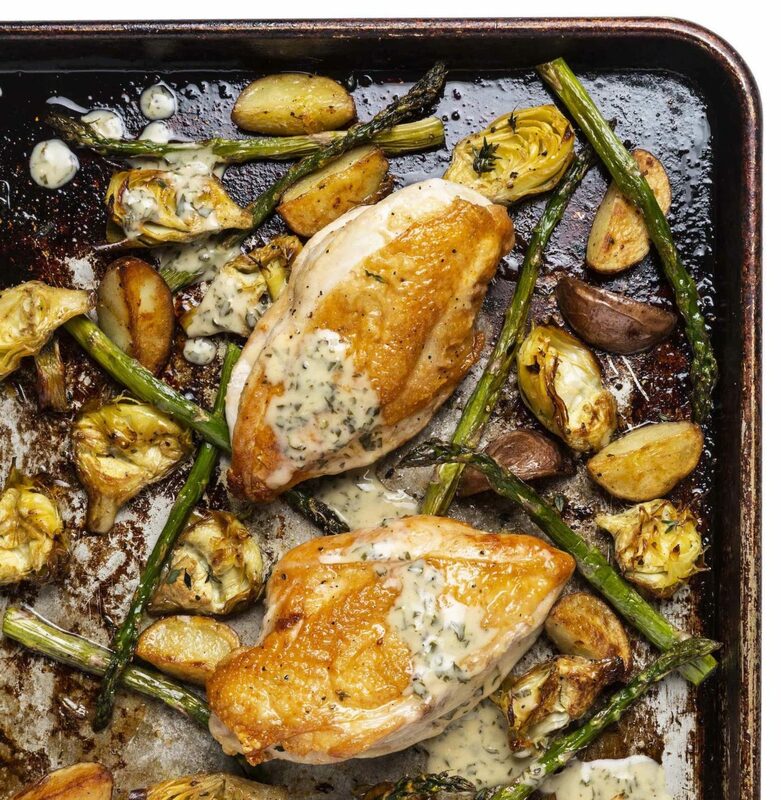 Here, crispy-skinned chicken, artichoke hearts, asparagus, and potatoes are roasted then finished with a luscious lemon cream sauce. Better still, everything is cooked primarily on a sheet pan, making this an easy meal anytime. You can substitute any vegetables you like to roast. Want to make it dairy-free? Substitute coconut milk for the cream. Preheat oven to 400°F. On a rimmed baking sheet, toss potatoes and artichoke hearts with 2 tablespoon olive oil, 1/4 teaspoon salt, and a grinding of pepper. Arrange vegetables cut-side down in a single layer, spacing them apart and roast until slightly tender and a bit golden, 12 to 15 minutes, tossing once halfway through cooking. Meanwhile, heat a large sauté pan over medium-high heat. Pat the chicken dry and season all over with ½ teaspoon salt, and ¼ teaspoon pepper. Add 1 tablespoon oil to the hot pan to coat, then add the chicken breasts skin-side-down. Let cook undisturbed until the skin is crispy and dark gold, 5 to 7 minutes. When the skin easily pulls away from the pan, flip and cook on the other side for 2 to 3 minutes. Transfer the chicken, skin side up, in one layer to the baking sheet with the vegetables, reserving the saute pan. Add the asparagus, thyme, remaining 1 tablespoon oil and ½ teaspoon salt and a few grinds of pepper. Roast until vegetables are tender and deep golden and chicken is cooked (no longer pink inside and with an internal temperature of 165ºF), 15 to 16 minutes. Meanwhile, add the chicken stock to the skillet and bring to a boil over high heat. Cook, stirring occasionally and scraping up any brown bits from the bottom of skillet, until the broth is reduced by two thirds, 6 to 7 minutes. Reduce the heat to medium-low and stir in the cream, parsley, and 1 teaspoon lemon juice. Cook, stirring, until sauce thickens to a creamy sauce, a few minutes more. Season to taste with salt and pepper; keep warm. Transfer the chicken to a cutting board and let the chicken rest for 3 minutes. Slice each breast into 4 to 5 slices. Divide roasted vegetables between serving plates, squeeze the remaining lemon juice over the vegetables. Add the sliced chicken, spoon over the cream sauce, and serve. Should’ve chicken breast be cooked to an internal temperature of 160? The recipe says 150.